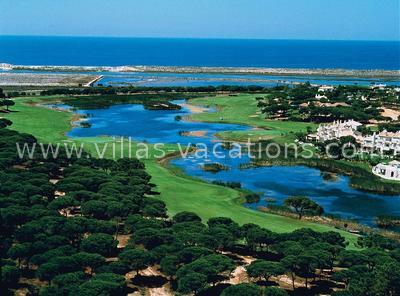 Located in the Quinta do Lago estate enjoys a reputation for the condition of its course and its attractive views around the lake formed by Ria Formosa. It has been ranked in the past as the second best course in Europe. The outward first five holes are through the pine tree forest. Water and good hole layouts provides the hazards that play a big part in players having to select clubs and hit with care. The eighteenth is a tricky par-4 mainly involving a lake that is waiting for the inaccurate shot.